I'm a very demanding kind of trainer: I can be on the computer for long periods of time, but I get bored from repetitive tasks and never moving. I'm level 110 currently and have been searching for methods of training, passing through bandits, pest control and green dragons but none have satisfied me more than training at the dagannoths at the Lighthouse. Here, if you do it correctly, it's fairly simple, you can gain up to 50-60 thousand experience an hour without spending much. Dagannoths mainly use range attacks, but hit really low if you use correct gear. Helmet: Warrior/Berserker helmet are fine. I have a preference for the Warrior helm, due to its Defence bonus. You can use a berserker for its strength bonuses. Chest: A rune platebody or over. This is a must have for survival. Legs: Rune platelegs or over. This is a must have to survive. Boots: Armored boots, Climbing Boots, it's not really important. You can use anything. Gloves: Recipe for Disaster gloves and gauntlets are good, but it's not really important, you can use anything. Cape: Legends cape, God cape, Obsidian cape recommended, any cape will do. Shield: Rune kite or over, though I suggest a granite or an Obsidian shield. However, it can be omitted if you have a full set of Guthan's. It is not recommended to use a defender here, seeing as your Defence versus ranged attacks will be penalized quite a bit. Weapon: Whatever you like to train with. An abyssal whip or a dragon scimitar/longsword are suggested. Ring: Ring of life recommended just in case something might go wrong. If your glory isn't charged, bring a Ring of Duelling instead. Amulet: Amulet of Glory. Charged is a preference. Food - Have a large amount of noted food that heals your Life Points at around 100 each. - Lobsters and Swordfish are good. Multiply the noted food amount by the price you bought it or how much you could sell it for and you get the amount of cash to take, and you'll be on the safe side. Potions - Super Sets are preferred, but simple attack and strength pots are pretty good too. You can buy strength potions 15gp each from the Warriors' guild. Don't forget to have noted potions too. The rest of the space should be filled with un-noted food items. Note: You can also train here with Bones to Peaches but it's not recommended. The store upstairs buys anything the dagannoths drop for a higher price than other stores and will un-note your food cheaply. If you take tuna or lobsters, just picking up the spears, javelins and oyster pearls is enough to pay for the un-noting so you don't need to take any money at all; simply pick up a couple of drops. Teleport to Rellekka using your Lyre teleport. Teleport to your house if it's Rellekka. Teleport to the barbarian outpost using Lunar magics, level 74 spell. 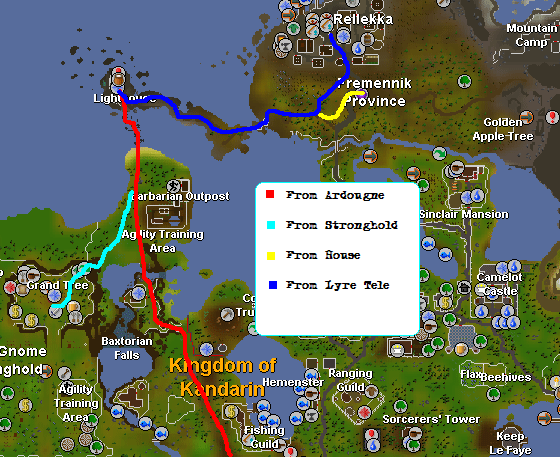 Teleport to Al-Kharid using a Ring of Duelling or an amulet of glory, use the glider to the Gnome Stronghold and use the North-Eastern agility shortcut at level 37. Inside the Dagannoth lair, you will have two types of Dagannoths: the level 74 which attack with range, and the level 92 who attack with melee. You want to attack the level 74 and avoid the 92 ones if possible. Once inside, attack a good number of level 74 Dagannoths (such as 7-10 or more if you have high Defence) to get them on your tail. Here you can decide to either let your auto-retaliate do the rest, or you can take measures to limit the amount of food consumed (see below). Depending on how often you need to check in and eat, you can attack more or less Dagannoths. If you set up a cannon, you can use it to make the Dagannoths attack you. This means that you won't have to run around to get their attention, but please note that using this technique will most likely make you hated by all trainers there. You could also set your cannon up in the northeast part of the room to cover less area (while still being effective) so that you won't anger all of the other people training there. Notice in the picture above, how the character is basically "hugging" the pillar. This way, you'll be able to browse the Internet a bit (such as the latest posts on the community forum!) and you won't need to devote every second to watching the RuneScape window. When you're out of food, exit the room and go up the iron ladder to the ground floor. 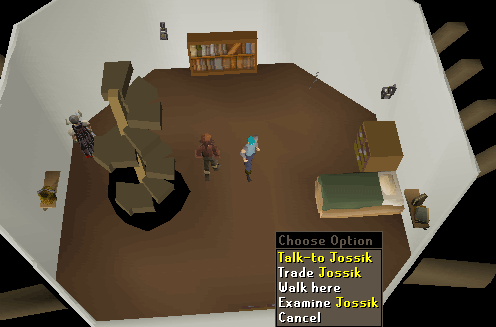 Climb up the staircase where you will find Jossik on the first floor. Trade him, sell him the desired amount of food from your noted food, and buy it back using your cash. 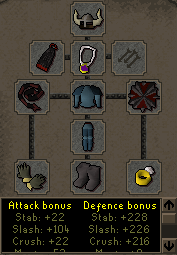 If you want to profit from the Dagannoth drops, you can teleport out using a Ring of Duelling to teleport to Castlewars, and teleport back to the Barbarian Outpost using Lunar Magics. You can also use an Enchanted Lyre from The Fremennik Trials to teleport you to Rellekka. The only drops from them that are acceptable are rare Herb Seeds like Lantadyme, Torstol, and Dwarf Weed, as well as level 2 Treasure Trail Clue Scrolls. You can also use Bones to Peaches, but it's not really effective since peaches only heal 80 Life Points for the damage dagannoths can inflict. Level 92 Dagannoths can hit up to 80 Life Points. Another method for the richer players would be keeping full Guthan's armor and it's spear in your inventory and using it's property of regenerating your Life Points depending on what you hit when you are in need of getting your Life Points higher. 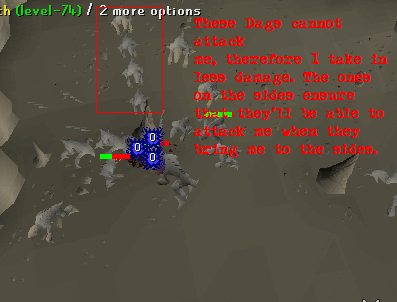 This method allows you to stay a very long time without moving from the Dagannoth pit, but is the most expensive.